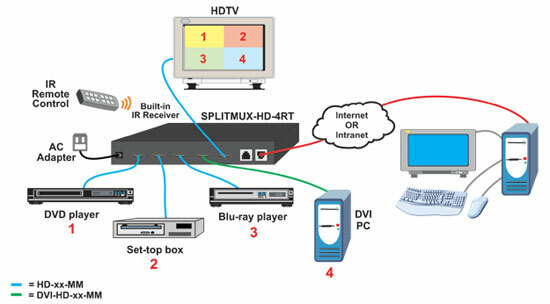 The SPLITMUX� HDMI Quad Screen Multiviewer allows you to simultaneously display real-time HDMI/DVI video from two, three, or four different sources on a single monitor. It is capable of displaying the video sources in quad, PiP, full, or custom mode. In custom display mode, each of the quadrants can be adjusted to any size and positioned to any location on the display. Four-channel non-mixing or one-channel mixing stereo with 16-, 20-, or 24-bit uncompressed PCM audio. Bandwidth up to 165 MHz (2.0625 Gbps). (Coming Soon) Pan and zoom any image input to focus on key areas. Select default EDID or copy EDID from output monitor. Supported output resolutions can be selected or set to auto detect. Available options: desktop unit, 1RU rackmount unit, dual side-by-side rackmount units in 1RU. Question: I am looking for a multi viewer that can display 3 images across an ultra wide display. 21:9 aspect ratio, 2560x1080 resolution. Would this product work for this application? 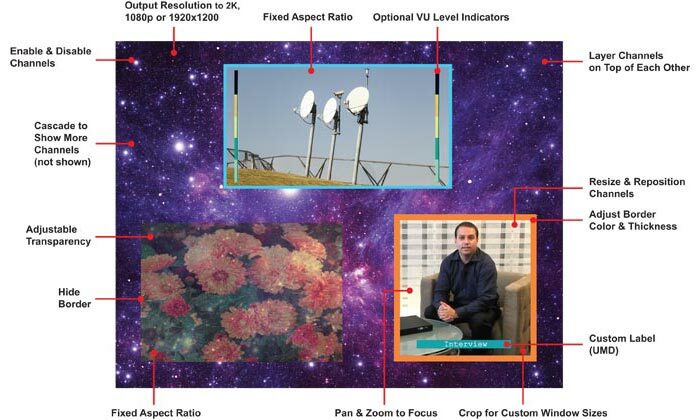 The bandwidth on the SPLITMUX-HD-4RT should support your application of an ultra wide display, 21:9 aspect ratio, and 2560x1080 resolution across. That being said, the manufacturer is unable to test that application currently - they don�t have a device on hand with that resolution - so we cannot really currently guarantee compatibility. As far as layout goes, you can use the 3 sources in many layouts for example side by side (3 across), or one large and rest smaller screens on the side, or any of the other available configurations seen in this NTI SPLITMUX-HD-4RT manual.